Do you lend your books out? When you read a really good book and want to share it, do you let your friends/family borrow your copy? Do you ever get them back? Yesterday I just got 3 books back that a "friend" borrowed back in July. Yes, July 09. Among them was my coveted Hunger Games! I've been after this "friend" to please give my books back for months and months. She at one point said she didn't have them anymore because she let one of her friends borrow them! WHAT?! I am currently on the hunt for a remaining 5 books that are amongst "friends." Am I a library? When did it become OK to NOT return a book that was borrowed? Is there a borrowing code? Do any of you have a system you use when you lend out your precious books? Any ideas for getting my remaining 5 books back? Seriously, though... I think the last time I lent someone a book was about 20 years ago. It's just too risky. I know that a lot of people aren't as careful with books as I am... and I don't want my books to suffer "book abuse"! SO TRUE!! They have suffered book abuse! They are not in very good condition now, and it upsets me. I've learned my lesson. I'm trying to retrieve my books and just keep them safe. Another friend has had my Twilight for over a year...why do people think that is OK? I'm paranoid about lending books (and movies). I lend them out only after a stern talking-to, and then I only let one out per person at a time. If someone is terribly suspect, I just say No. It's worked pretty well so far, except when it comes to my Mother! She is the WORST! She forgets she has them, loses the hardback covers, etc. Sometimes she even gives them away because they sit around at her house so long (because she forgot to give them back) that she feels they're just clutter! It's terrible! This is a great topic! I borrow and lend out books quite often, but only to my close friends. I try to make it clear that I expect them back in the same condition, but sadly that's not always the case. I have a problem... I am always recommending books and thus lending them out, but I just want them back!!! It is rare to get anything back in a timely manner even from family, and I have one friend who has at least 10!!! I try to use LibraryThing to keep track of who has what but unfortunately while I am away my roommate often lends them out. She has also dropped them in the BATHTUB(!!) before! I do lend.... and I keep a list on a dry erase board in my reading room so I know who has what. I don't share books. Terrible I know but I'm so particular. I have a hard time lending....because well, I lent mr JR Ward series to someone and got back all of them except the newest one...I want it back. I know dhe's done with it, so why not return it? *sigh* I don't understand that. I only lend out a very few books and only to people that I know will give them back without lending them on. When I lend I make it clear I want it back. Otherwise I give books to people that I don't want back. Don't lend books!! Too many people don't return, give them to someone else, etc.. I work at the library in my small town, and you'd be surprised how many people will check out a book and then loan it out!!! Then the book gets lost, person gets mad cause they have to pay for it!! Or they check out books and never bring them back. So no, I DON'T EVER lend my books!! I'll only lend books to people I know will take amazing care of them. I'm one of those people who like to keep their books in insanely good condition, so I rarely take the risk. My AUNT still has two of my books (going on five years now), and my best friend still has two. It's not too bad, since I know where they are and can just go over and get them back at any time, but I'd still like them to take the initiative and return them without prompting. As for getting your books back, just keep asking (or even just turn up and ask for them). Eventually they'll cave and return them (hopefully). I hate lending out books, esp. my favs. I know I have lost many a good book when I give in and I am territorial about my books - I keep them forever and my bookshelf is overflowing! I'll recommend, but unless you are family (or a rare friend), I'll just give your the title and author name. It makes me sound horrible to say that outloud. Oh well. Ironically, before I saw this post I wrote one on this topic on my blog. (coincidence) I had an experience on this. I'm against lending now! It annoys me so much when I lend people books and they lend them to somebody else - grrrrrr! I try not to lend now, unless it's a book that I haven't really enjoyed!!! Great blog by the way and great post too! I'm very particular with my books so I make sure that I take very good care of other people's books. My mother in law has loaned many books to me like 10 at a time (I didn't ask for them). So, when I told her I still had all the other books she had loaned me she said it was fine & to just return them when I finished with them. I feel terrible & have returned some I know for a fact I won't read at all. The rest, I still have to read. As far as loaning is concerned, I don't think I would loan to just anyone. I would loan only to those friends I know will take good care of them & won't loan out to other people. Also, never loan a whole series at the same time. Loan the first in the series & wait until it is returned to loan the 2nd in the series & so on. That's what I did with my sister, it worked out quite well. Keep track of who has what books & check them in/out like you would at the library. If a particular friend is terrible with books then stop loaning them out to her/him! The best option is to not loan them at all! I almost forgot to answer the last question. 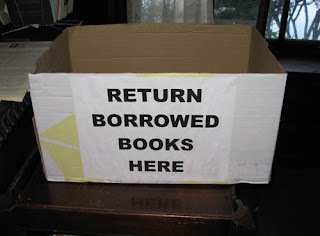 Ask your friend to borrow your book back or ask for another book & wait until your books are returned to return their books. It's only fair! I have a friend that writes the name of the person she let borrow the book in the dust jacket, and she keeps that part. When she gets it back, the cover goes back on, and she always knows who has her books. For me, I have several that friends have not given back. They are too expensive to keep loaning, but most of my friends are good about it. I have 3 paperback books right now that a friend let me borrow. I have not yet read them, and feel guilty about it!